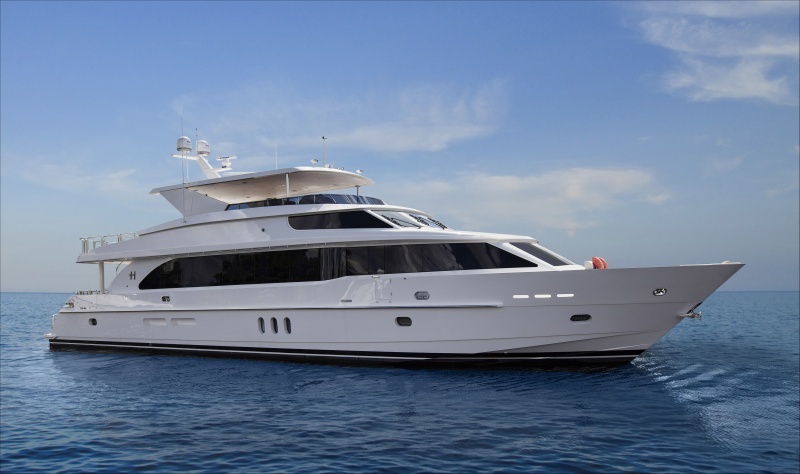 2017 100 Ft Hargrave Pilothouse You will quickly notice that no two Hargrave yachts are exactly alike. 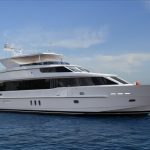 Hargrave yachts are custom boats and are all different when they are new and so they are all different when they are presented in the resale market. 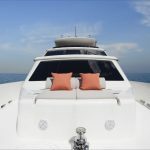 Hargrave’s ability to build fully custom yachts means more choice and variety for buyers shopping for a pre-owned yacht. With production built boats when you’ve seen one, you’ve seen them all, but not with Hargrave. Additional Specs, Equipment and Information: Boat Name SUNNY Specs Builder: Hargrave Custom Yachts Flag of Registry: United States Dimensions LOA: 101 ft 0 in Beam: 21 ft 0 in LWL: 91 ft 0 in Minimum Draft: 5 ft 8 in Maximum Draft: 5 ft 10 in Bridge Clearance: 33 ft 0 in Engines Total Power: 3650 HP Engine 1: Engine Brand: Caterpillar Engine Model: C32 Engine Type: Inboard Engine/Fuel Type: Diesel Location: Starboard Engine Power: 1825 HP Engine 2: Engine Brand: Caterpillar Engine Model: C32 Engine Type: Inboard Engine/Fuel Type: Diesel Location: Port Engine Power: 1825 HP Cruising Speed: 21 knots Maximum Speed: 24.5 knots Tanks Fresh Water Tanks: Stainless steel (600 Gallons) Fuel Tanks: Aluminum (3200 Gallons) Holding Tanks: (200 Gallons) Walkthrough Design Influences and Color Pallet: Our main objective was to create a yacht that had spacious guest areas for entertaining and relaxing that flowed together and felt intimate. The color pallet of light taupes, silver, white complemented with true island colors of coral and saffron. 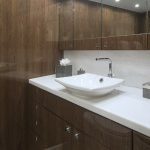 These tones work perfectly against the rich walnut veneer wall panels and the exquisite driftwood tone maple cabinetry. Aft Deck: The aft deck is lovely and open with an 84” dining table and with very comfortable seating either on the aft bench or the (5) Kingsley-Bates teak and white mesh chairs. Port forward there is a large TV that is housed in the ceiling and remotely lowers over the walk up bar area. The Port bar cabinet has a refrigerator, ice maker and a large cabinet for storage. The starboard side forward there is a 2nd door to the crew area lazzerete and engine room. On each side the aft deck there are curved comfortable teak steps to the swim platform and a 2nd access to the crew. At the top of the steps there are (2) safety gates especially useful for young children or pets. Main Salon and Dining Features: The main salon is casual, soothing, open and luxurious. The wood is high gloss walnut off set with the occasional wall upholstery. Then on the forward bulkhead is an extraordinary 10′ expanse of shimmering silver finished bamboo with platinum thread. 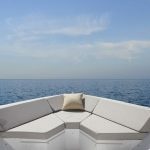 The upholstered furniture is extremely comfortable and all fabricated expressly for this yacht by American Leather Group. The sectional sofa is upholstered in a linen blend of neutrals and is accompanied by (2) gray leather chairs to starboard. Aft there is a chair from the same group as the sectional also in linen; large and plush. 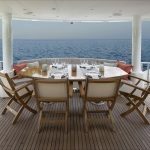 The side tables, cocktail table and dining table are all in a driftwood gray maple from Toseva and are were custom designed by Yibs expressly for this yacht. The room consists of blends of neutral grays, taupes and whites. This is accented with coral tones of throw pillows and accessories. 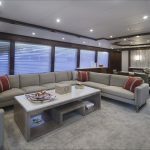 There is a walk up full service bar on the port side aft and directly across the room there is a 65″ screen TV; complete with all the extras for entertainment. Forward starboard is the dining area and there is a tall storage cabinet for stemware. To kept the contemporary asymmetrical theme there is a full view window on the port side directly across. The dining chairs are Italian belted bronze leather that are very slick and complement the edgy sculptural dining table perfectly. The windows also have a new clean look in a sheer by day and privacy at night multi-functional silhouette shades from Hunter Douglas. Gloss Walnut Custom Cocktail Table (2) Wine coolers Dining console with Bianco Rhino top Walk up Bar Aft 65” Screen TV Custom Ceiling panels Custom rectangular dining table and base Sectional Sofa & Aft Club Chair – American Leather Savino / Apollo Natural Throw pillows- Kravet- Flame (2) Starboard Club Chairs- Gray Leather (8) Dining Chairs- Antonello Italia – Luna B Armchair/ Lead Grey Wall Covering – Hartman Forbes/Seaboard Pier Wall Upholstery – Majilte Ovation/Light Gray Carpet-Fabrica- Bel Aire Day Head: The day is one of our favorite areas to design. So much happens in this compact space and there is so much opportunity for this room to be a show- off! 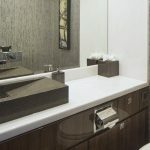 We started with a straight line vanity in Bianco Rhino marble and had a custom a rectangular Silestone vessel sink made complete with a slotted SS long rectangular drain. The faucet is a twist model from Altman in polished chrome and is mounted on mirror. The water control is a joy stick and is mounted on mirror wall also. The Wall covering is a linear chocolate grass clothe on top metallic silver from Philip Jefferies. The ceiling is mirror and the floor is a slab of Bianco Rhino Slab with Emperadora Gray Border to match the vanity. Flooring- Bianco Rhino Slab with Emperadora Gray Border Wall Covering- Phillip Jefferies 3312 Zebra Grass Wall Mounted Faucet- Altmans Spira/ Polished Chrome Vessel sink- Sono Bath- Custom Hydros/ Silestone with river rock Galley: The galley is stunning Aurora granite which is off white with small taupe and silver 2” splashes of color. The granite, Stainless Steel appliances and the white mosaic backsplash all work so well together. The floor in the galley is solid teak plank. It is in installed in a plank wood style pattern and beautiful and durable at the same time. There is plenty of storage, pullout pantries, (2) refrigerator drawers and a gallery style 36” refrigerator and double sinks, all in stainless steel and (2) tall Chef style Blanco faucets. There are also (2) bar chairs that work at the island or turn around forward to give extra seating at the table. Large Walnut Table and Walnut cabinets GE Profile Refrigerator and Appliances in Stainless steel Franke Stainless Steel Sink Sub Zero Refrigerator drawers with custom Gloss Walnut fronts Aurora Granite counter tops White Mosaic from Catalfamo backsplash over cooktop 32” Samsung TV (3) Pantries Large Walnut Table and Walnut cabinets Pilot House: The pilot house was designed to be multi-functional. It is a serious helm station with a Stidd chair for the Captain, complete with a Captain’s desk and lots space for filing. It was also designed to be an area the owners and guest can hang out while traveling or in the evening congregate on the deep overstuffed club style sofa with a 270 degree view outside. Helm Chair- Stidd-Ultra leather/ Ultra Leather –Promessa /Tusk Sofa- Ultra Leather –Promessa /Tusk Throw Pillows-Robert Allen-Glintwood/Mica Floor- 4” Teak Planks Lower Foyer: The stairs down to the foyer have an elegant comfortable curve to them. 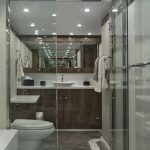 The walls are gloss walnut, until you are just about to land on the elegant gray Emperador marble with SS inlaid floor. The walls at the last step change to a pebbled pearl finish in a commercial grade vinyl. This brightens up the entire lower deck and reflects daylight that spilling from the large stateroom windows. 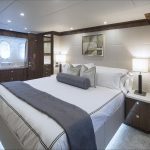 There is a discreetly placed laundry room with a privacy door and lots of storage for soap, cleaning supplies and the hampers- all hidden behind the door Master Stateroom: The master is a breath of fresh air! The bedding; all white Italian linens with elegant pewter stitching, big fluffy duvets coordinated with shams and pillows. There is lounge bench to port that looks like it belongs to Hollywood actress. A (9) drawer dresser is on the starboard. All of the bedding is on the bed and is used at night. So the storage below is now open for owner items. There are only () throw pillows to store at night when the crew is doing turn down. 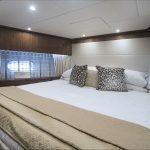 No heavy bedspreads to stow in the evening The master is a full beam stateroom with the Hargrave signature his and hers bath. All of the marble is impeccably fabricated with Bianco Rhino and Emperador gray borders and slabs simply combined. Even in the 22 square foot shower the marble is fabulous. Gloss Walnut Home Treasures Duvet Cover & Shams – Borders Grisaglia Gray Throw Pillows – Kravet Allure 32515-11/ Moonstruck Upholstered Bed Base – Majilte- Legacy Platinum Free Standing/Bench- Zimmer & Rohde-Tinto 10611-991 Headboard Wall- Majilte- Legacy Platinum Starboard Guest Stateroom: Queen with easy conversion to twins. The convertible beds go from queen plus to (2) twins with an easy lift of the night stand top and a change of bedding. This room has everything the master has in bedding, comfort, exquisite finishes and a gorgeous bath of marble. There are large hanging lockers, lots of drawer space, a full chest of (4) drawers and full walk around beds in either position. Sheer net lace shades filter the light by day in and at night the drapes are pulled for full privacy. Upholstered Headboard Wall & Above Nightstands – Majilte- Legacy/Platinum Drawers under bed Bianco Rhino Nightstand Counter tops Dual Window treatments Throw pillows-JF Fabrics/Abigail Starboard Guest Stateroom: This room has a queen-plus bed and has all of same specials elements as the Starboard guest and the décor is exactly the same, so all guests feel equal. 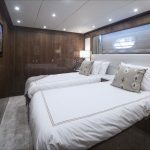 VIP Stateroom: Forward of the Galley is another King stateroom; the VIP. This room has similar fresh characteristics of the master n a compact version. The headboard is also horizontally upholstered in faux leather of Majilte- Legacy/Platinum. There is an entertainment cabinet forward with a large TV. There are (2) large hanging lockers and drawers at the foot of the bed. The windows have a big sheer stripe for day time coverage and Kravet- White silver drapes for black out at night. The bath has a Kohler semi recessed vessel style “Escale” sink and a slim Grohe-Essence faucet. The Emperador grey with and the Bianco rhino Marble looks fabulous with the Gloss walnut. The outboard wall over the sink is all storage with mirrored fronts to maximize light and below this area is another full cabinet for storage. Gloss Walnut Upholstered Headboard Wall – Majilte- Legacy Platinum Drawers under bed Dual Window treatments of Kravet 3923-816 stripe Kravet- 33280-1White silver and J Fly bridge: The Fly bridge can easily seat (24) in comfort. There are (2) large L shape settees and a full service bar to port with (4) bar stools. 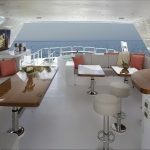 There are also (2) medium size cocktail tables that convert to dining tables and a large dining table to starboard. 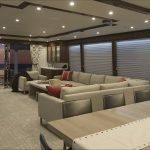 The exterior fabrics were selected to complement the rest of the yacht and are in gray taupes with Caribbean pastels coral, mango and sand. The “sun pad” is actually under the hard top so we call it the “sunless pad”. Everyone wants to lounge around outside but not necessarily get sun, so we positioned this area undercover. 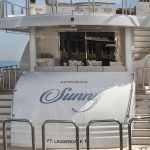 For those that want to sun we have Chaise lounges aft. To the port aft side there is a grill/cooking area. To the starboard aft area there is a built-in cooler and Subzero drawers for refrigeration. The 60” Spa tub is also in this area and has a beautiful teak bar with stools aft. The FB is laid out perfectly for entertaining and fun. 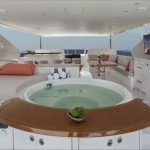 (2) Forward Facing Helm benches/elevated (2) Large L shape settees Grilling Station and Subzero drawers Spa Tub and Spa bar “Sunless Pad” 6’ Bar with (4) stools Crew Lounge: The crew area is aft and has (2) entrances. 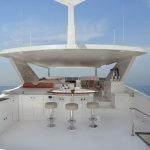 There is a staircase from the aft deck to the crew lounge/crew galley and laundry area. There is an 8’ settee and flat screen TV for time off. The crew galley is complete with under counter refrigerator, sink and microwave. 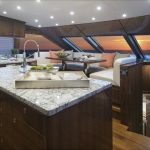 They also have the same beautiful stone as the main deck, Aurora, and under the counter is a front load washer and dryer. 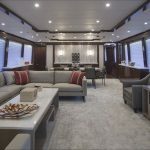 Crew Utility/Lazzerete Room: The elegantly curved transom houses the door to the to a captains dream work benches and storage area for all things mechanical. There is also a wet hanging locker for weather gear and a 6′ high tool chest area. The second entrance to the crew area is the electric transom door that lifts up for passage into the Utility/Lazzerete. This room has black Formica countertops for industrial use. The room is full beam and has an abundance of storage space above and below the cabinets. Going forward from this area to the (2) crew cabins is a water tight door. There is also another water tight door forward of the crew lounge entering the engine room. 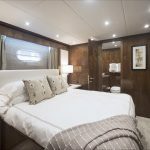 Captain Stateroom: The Captains Stateroom has a queen bunk or splits in to twins when needed. Big drawers below and some more storage above. There is a huge hanging locker. The nightstand has plenty of outlets for charging all of the mobile items we all have these days. There is also a desk just before entering the head. Crew Stateroom: Across the hall from the Captain are the (2) spacious Crew bunks 36” wide. There is an area also in this room for charging devices. 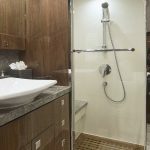 Both crew staterooms have private baths. This crew area is really different and has a great functionality about it.